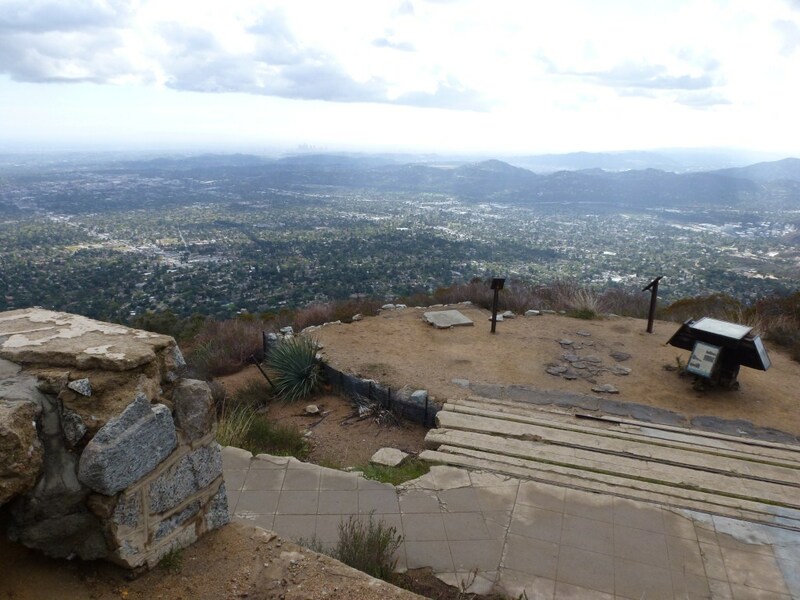 The White City Ruins are what remain of a resort that existed at Echo Mountain in the early 1900’s. There are remnants of of the resort and associated structures, incline railway leading to it, and the electric railway leading from Echo Mountain to the Alpine Tavern (now Mt. Lowe Campground) near Inspiration Point. In addition, there are several signs throughout the ruins sharing the history of the resort and the people who built it. View overlooking remains of the incline railway landing from what is left of the stairway leading to the hotel. 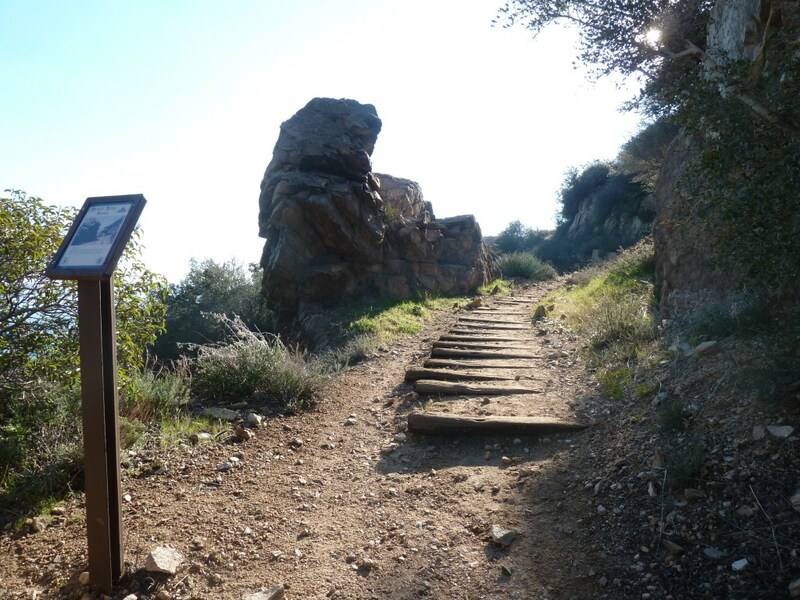 An extremely popular way to get to Echo Mountain is to take the Lower Sam Merrill Trail. 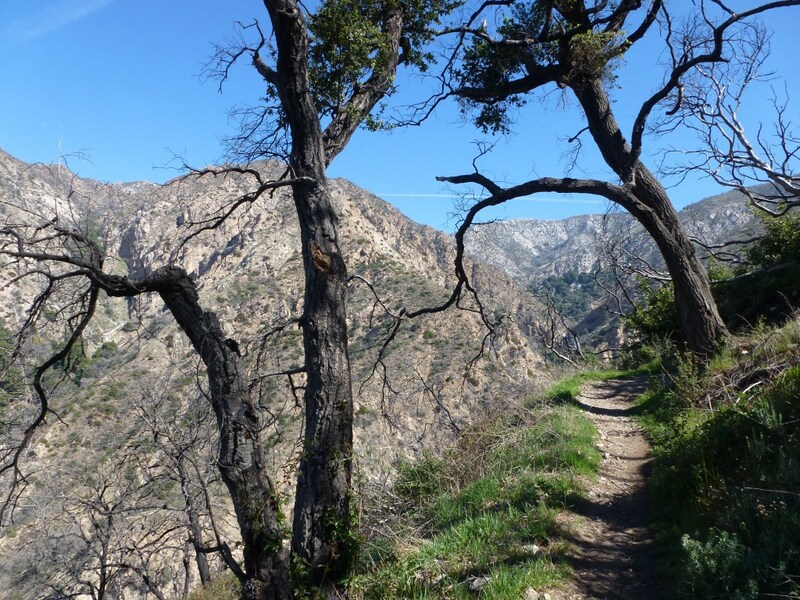 This trail offers great views of the city and on a clear day the ocean and Catalina Island are easily seen. These views are the primary appeal of the trail itself until one reaches Echo Mountain. Significantly, there isn’t much shade on this trail. Therefore, a great time to hike it is in the winter, early in the morning, or at dusk. I prefer to hike it at dusk or even after sunset. Several hikers make their way up to Echo Mountain in the evening, so it’s relatively safe to travel at night when compared with other areas of the forest. With the ocean off in the distance, sunsets are typically magnificent. Another way to get to Echo Mountain is to take the Sunset Ridge Trail from one of the two trailheads off of Chaney Trail in Millard Canyon. The shorter path starts from the gate and meets up with the Upper Sunset Ridge Trail and ends up at the Cape of Good Hope. Unlike the Lower Sam Merrill Trail, the views are essentially of the forest. The trail is often shady and there are nice views of Millard Falls. Presently however, access to the falls is closed. There is also a nice picnic area with a view of the city at Sierra Saddle just over half way to the Cape of Good Hope. The longer path starts near the Millard Canyon Campground. 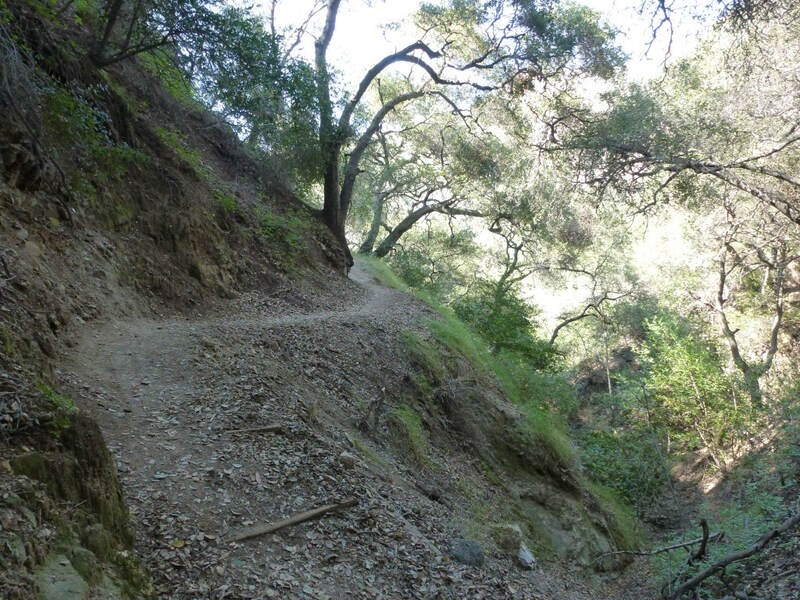 It includes the short lower part of the Sunset Ridge Trail (about 0.8 miles) and is a shady trail leading up to the Upper Sunset Ridge Trail. From the Cape of Good Hope, the Lower Mt. Lowe Railway Trail leads to Echo Mountain. This trail is interesting as there are remains of the old electric railway and several railway bridges. Along the way, there are signs throughout showing pictures of the train at the time it was running. If you are going with a group and taking multiple cars, another option is to leave a car at the Cobb Estate Trailhead and a car at one of the two trailheads off of Chaney Trail and do a shuttle hike. This entry was posted in Hike and tagged Angeles Forest, Car Shuttle Hike, Echo Mountain, Electric Train, Hiking, Incline Railway, Lower Sam Merrill Trail, Millard Falls, Sunset Ridge Trail, White City Ruins by Kyle Kuns. Bookmark the permalink. Hi Kyle, Thanks for the welcome to L.A. on my last blog post! I love your site and your photos are great! We’ve heard so many good things about local hiking spots and trails and I’ll definitely be checking out your page for some ideas! Hi Kyla, thanks for stopping by my site. Good luck with your LA experiment and I hope you find some hikes here that you enjoy. I have a nephew in LA. I may have to visit him and make him take me here! Man- I wish had been in town for this hike. Great descriptions! Thanks Kendyl. It would have been great to have you along.